181 photographic internegatives: b&w and col. 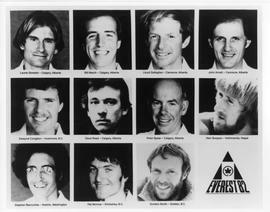 In 1978, a Canadian team of climbers was granted permission for an autumn 1982 expedition to climb Mt. Everest via the Nepal side of the mountain. The objective was to put a Canadian team on the summit for the first time, via a new route on the mountain’s South Spur. In 1981, the Montreal-based company CanEverEx was formed to facilitate the marketing, promotional, and licensing aspects of the expedition. Montreal-based Programmed Communications Limited was subsequently contracted by CanEverEx and the Canadian Mount Everest Society to further act as an administrator and curator of the photographs and other media produced during the expedition. Air Canada joined as a primary sponsor for the expedition, and extensive press coverage and promotional opportunities were planned. In 1979 The Calgary Herald and Southam News bought the newspaper rights for the expedition coverage and the television rights were acquired by the CBC and ABC. Teleglobe Canada was engaged to provide a satellite configuration that would provide the first-ever live video links between Everest and Canada, and further video and photographic documentation was enabled through sponsorships from Hitachi, Leica and Kodak. A specially-chartered Air Canada cargo plane delivered expedition supplies to Nepal via India in April 1982, accompanied by a small advance party of climbers and photographers. The full team departed for Nepal in July 1982, under the leadership of expedition leader Bill March. Several months in to the expedition, on August 31, an avalanche hit in the Khumbu Icefall, killing 3 of the expedition’s Sherpa team members, including Ang Chuldim Sherpa (age 18), Pasang Sona Sherpa (age 40), and Dawa Dorje Sherpa (age 40). 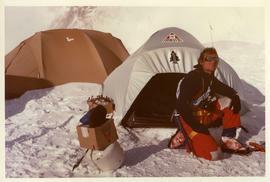 A second Icefall accident occurred on September 2, killing expedition cameraman Blair Griffiths (age 33). Following this, 6 climbers left the expedition, including Tim Auger, Rusty Baillie, James Blench, Jim Elzinga, Dave McNab, and Don Serl. Team doctor David Jones also left due to health reasons. The planned South Spur route was changed to the South Col route, and on October 5, 1982, Laurie Skreslet became the first Canadian to summit Mount Everest with Sherpa team members Sungdare Sherpa and Lhakpa Dorje. Two days later, on October 7, team member Pat Morrow reached the summit with Lhakpa Tshering and Pema Dorje. Upon their return to Calgary, Programmed Communications Limited greeted the team and members of the press with a welcome home slideshow presentation, using photographs that the team members had taken along the way. The team was subsequently honoured in Ottawa by Prime Minister Pierre Trudeau. Jim Muir’s Montreal-based company Programmed Communications Limited (PCL) held the contract to manage the 1982 Canadian Everest Expedition’s photograph and slide files, and to create presentations and other promotional events related to the expedition. Because of PCL’s integral involvement in developing the media campaign around the Everest project, Muir amassed a substantial collection of expedition-related records. In the mid-1990s, he transferred his collected Everest records to the Centre for Mountain Culture at the Banff Centre. He established a verbal agreement with Bernadette McDonald, founder and director of Mountain Culture at the time, and the records were retained by Mountain Culture. On July 20, 1998, the records were transferred to Centre’s Archives for temporary storage. During this time Mountain Culture periodically licensed some of the collection’s video footage, and created digitized copies of this footage. In 2018, the materials were were formally accessioned by the Archives. The audio cassettes were brought back to Banff by John Amatt, who donated them to the Banff Mountain Film Festival in 1982. Michael Breckon's material was added to the collection in March 2019. The collection consists of a broad range of records and media generated throughout all stages of the 1982 Canadian Everest Expedition, from the advance promotional and logistical preparations in Canada and Nepal through to the realization of the expedition in Nepal, and post-trip presentations within Canada. These materials were primarily assembled by Jim Muir, whose Montreal-based company Programmed Communications Limited was in charge of organizing and maintaining the expedition’s photographs and slides, as well as developing presentations and other promotional activities. The collection is divided into 6 series and two sous-fonds, with the arrangement reflecting the diversity of the types of materials accumulated, as well as the organization of Muir’s own administrative files. The collection includes Muir’s correspondence and administrative papers from the expedition, press clippings and selected publications related to the expedition, photographs and slides taken by expedition team members and other press affiliates in Canada, Nepal, and on other training climbs around the world, film and video (both raw footage shot in Nepal by expedition members, as well as news programs and promotional presentations), and a vast selection of audio material (both field recordings and Base Camp transmissions, as well as more-formally produced presentations and radio programs). One sous-fonds contains oral history interviews that archives practicum Abigail Sebaly has conducted with expedition team members and affiliates in 2018.